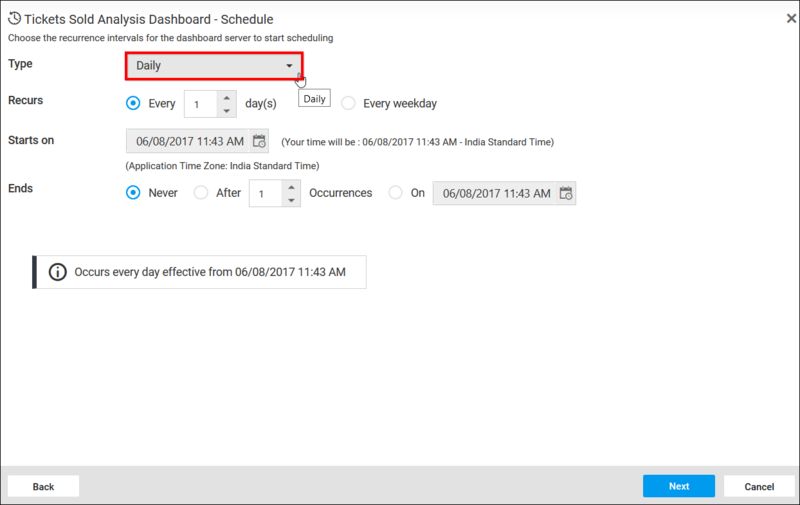 Manage Data Alerts in the Syncfusion Dashboard Server. Data Alert provides the users to track certain conditions and respond it to a specified recipients via mail when a certain pre-defined threshold is met. 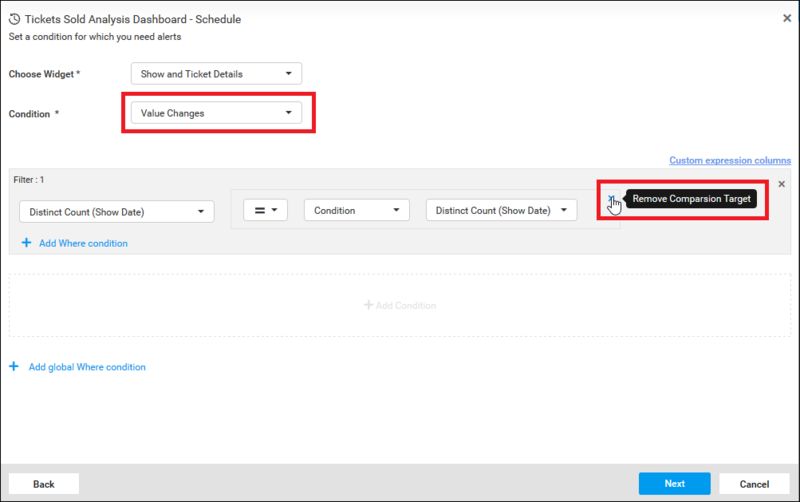 Follow the below steps to create the new Data Alert with the desired dashboard. 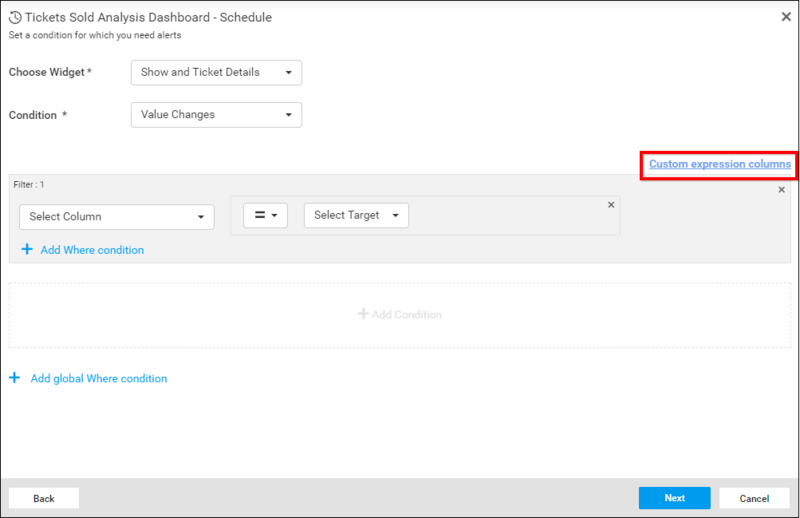 Click the Actions button in the dashboard grid context menu and select Create Schedule to schedule the corresponding dashboard. 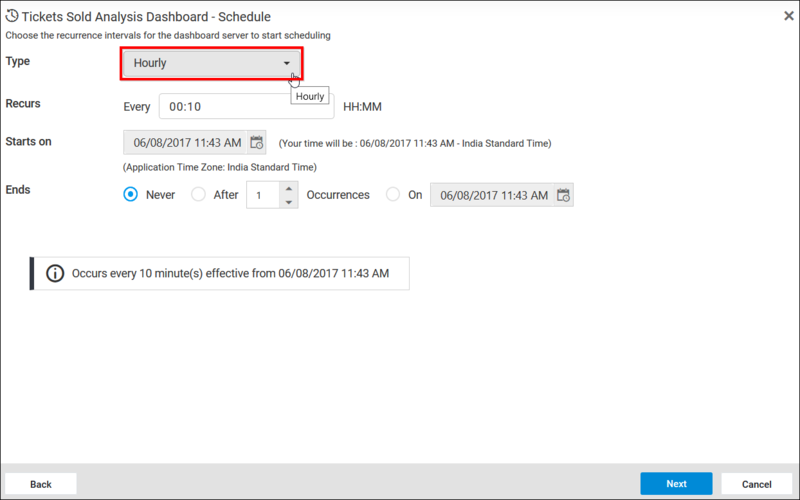 Schedules can be created for both single dashboard as well as multi-tabbed dashboard. 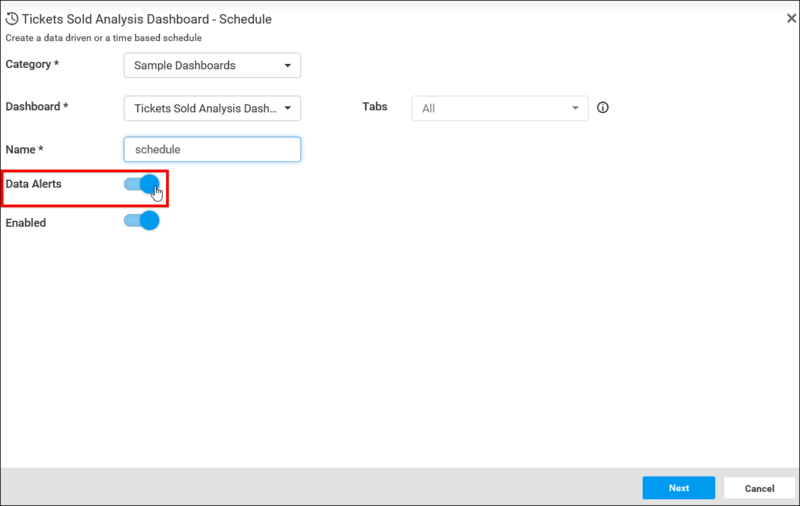 For multi-tabbed dashboard, Tabs dropdown will be enabled and the dashboards inside the multi-tabbed dashboards are listed in it. 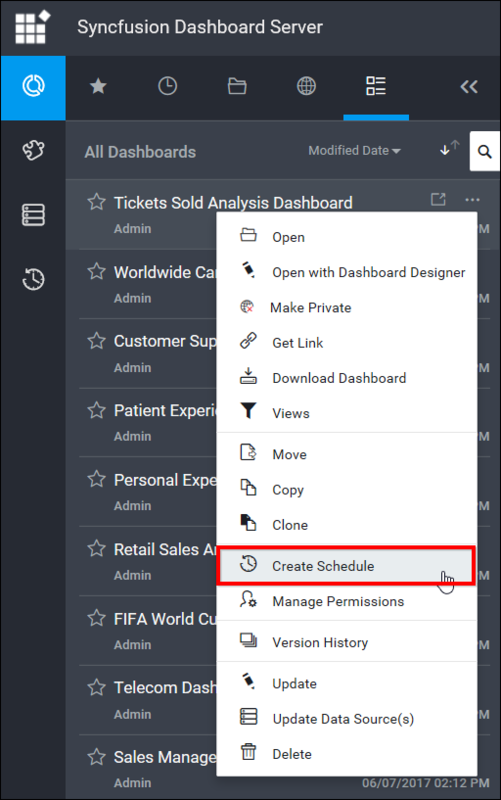 Enter the schedule Name and then Data Alerts needs to be enabled. Data Alert screen has the option to add conditions for the desired dashboards. Each Condition has the Source ColumnName, Aggregation, and Target column to compare. A Where Condition can be added as globally or for each condition. After the successful validation, the user can be navigating to the next screen, otherwise, the error message displayed at the top of the dialog and the screen remains exists until the successful validation. 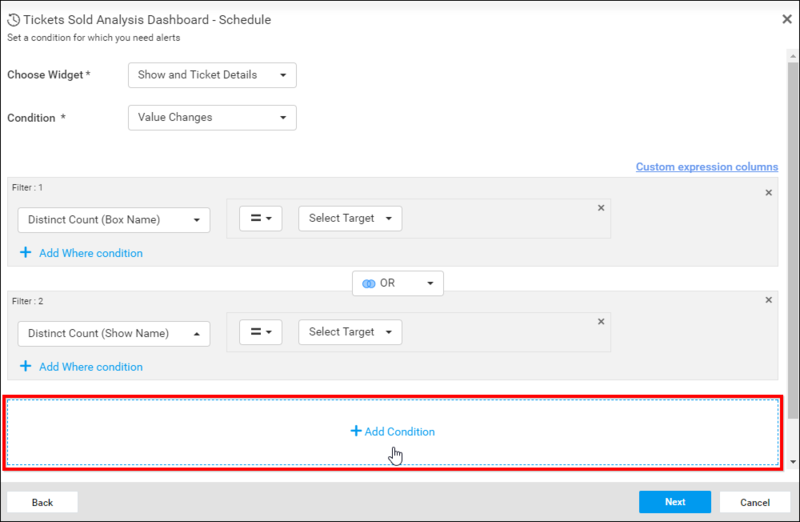 Select the Widget which you want to add threshold condition and select any one of the Condition. By Default, the Condition will be Value Changes. Value Changes - Checks whether the filtered value changes. Value Changes can be evaluated either Expression or a single column. If it is an Expression, the user can be notified when it satisfies the condition. 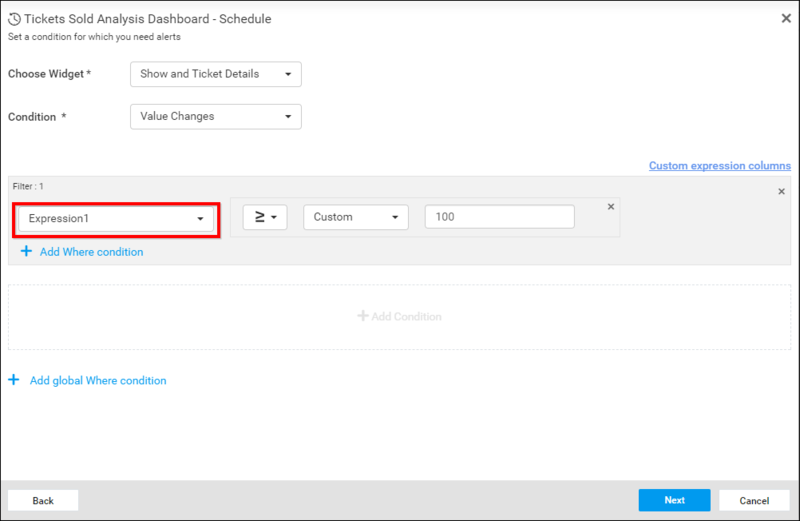 If it is a single column, the user can be notified when there is a change in the column value compared to the previous value. Increases - Checks whether the filtered value increases once. 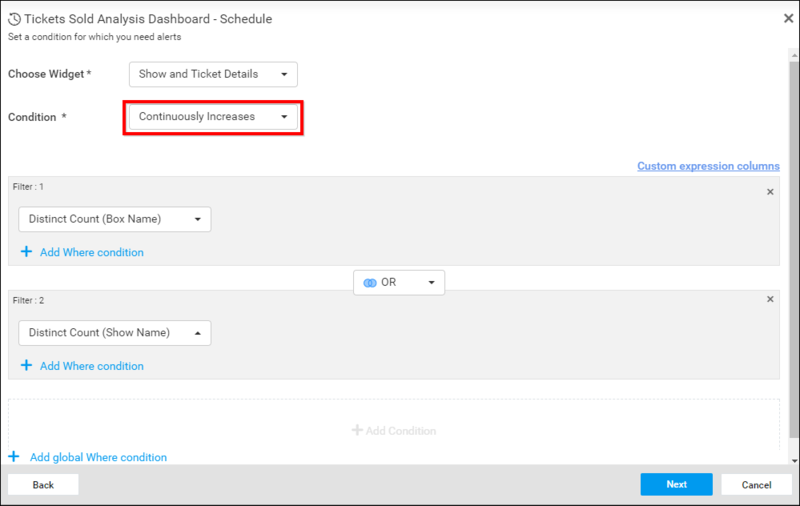 Continuously Increases - Checks whether the filtered value increases continuously. Decreases - Checks whether the filtered value decreases once. Continuously Decreases - Checks whether the filtered value decreases continuously. Add more conditions by click on Add Condition button. 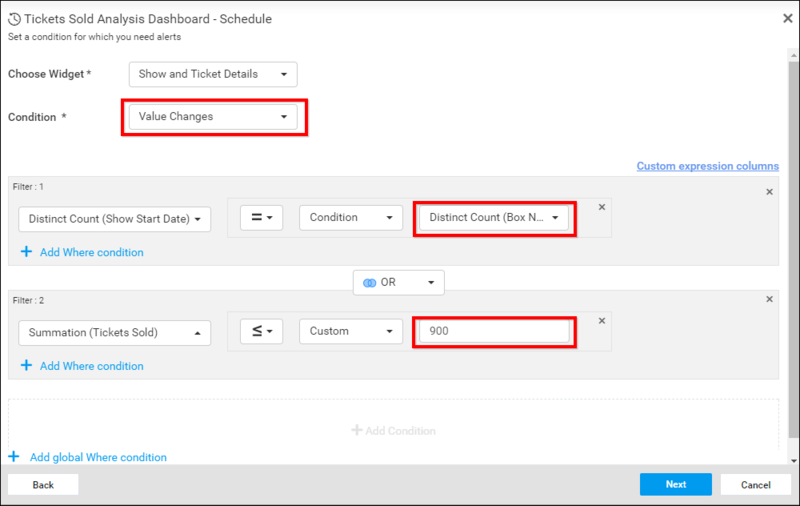 Add Where condition for each filter by click on Add Where Condition. The column values can be compared with custom or actual values. Actual values are listed from the database and the custom values are the input provided by the user. In Data alert, a new option is included to create expressions with the combinations of unbounded data source columns of selected widget and multiple functions. For instance, [Sum(Column1) - Sum(Column2)]. 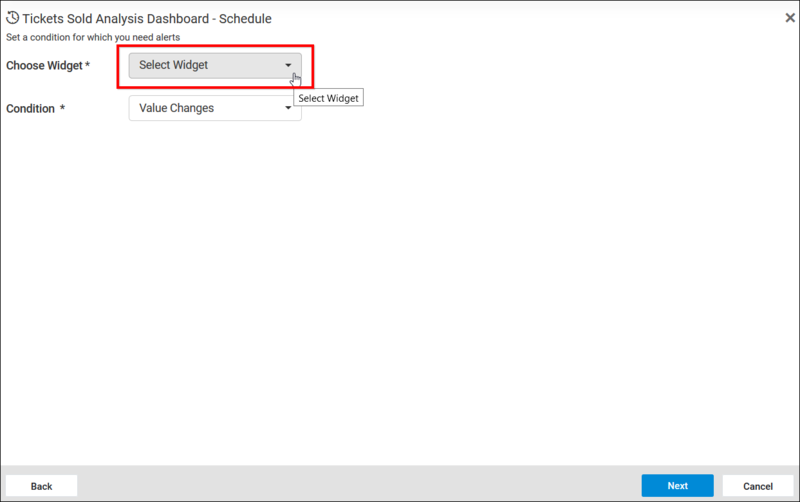 After selecting the widget, click on the Custom expression columns label at the top of filter in data alerts screen. 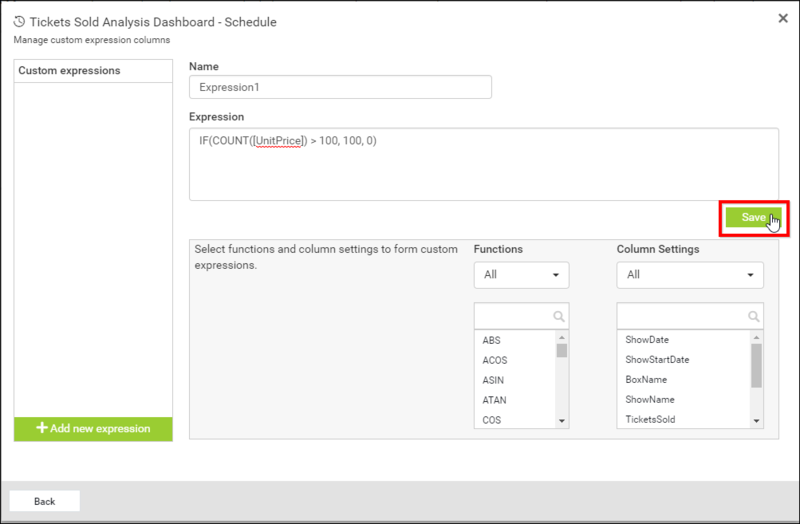 In above dialog, Custom expressions column lists all the saved expressions of the appropriate datasource. 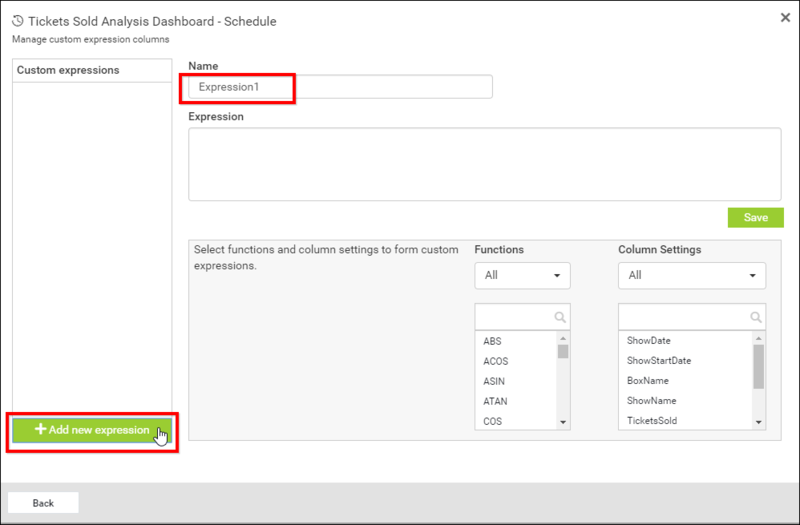 You can add new expression by providing values to name and expression input fields. 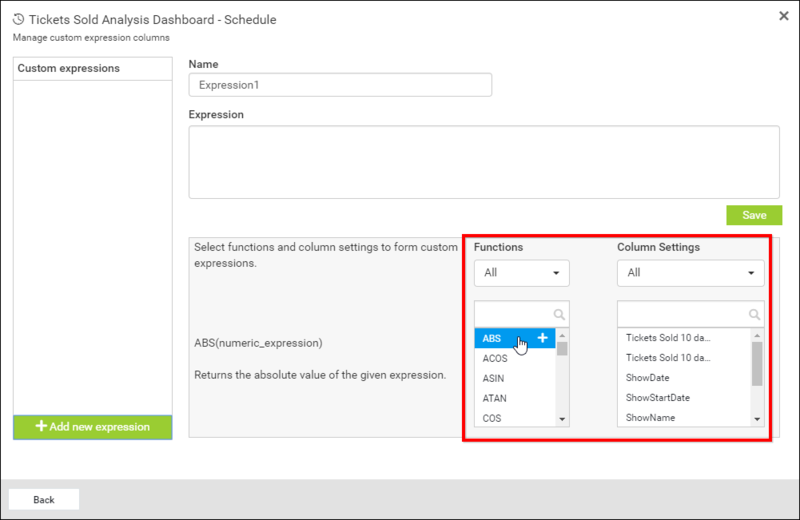 Functions and column settings drop downs provides multiple functions and datasource columns of selected widget to create expressions. Click on the Add new expression button to add default expression name in name input field. Expression name can also be changed. Expressions can be formed with the combinations of functions and column names, from the functions and column settings drop downs. Functions and column settings are categorized under various types and they can also be filtered by the first dropdowns underneath its headings. While hovering over the functions, the syntax and short description of them are displayed to its left. Expression can be inserted into its input field by clicking on the required values from the functions and column settings drop downs, the inserted values are added in appropriate cursor position. Created expression can be added by clicking on the save button. When clicked on any expression in this list, the appropriate name and expression is filled in the right panel. You can update this saved expression and can be saved again. Expressions can be deleted, by clicking on the close icon, which is visible on hovering the custom expressions list. Click on the back button to close the custom expression dialog. 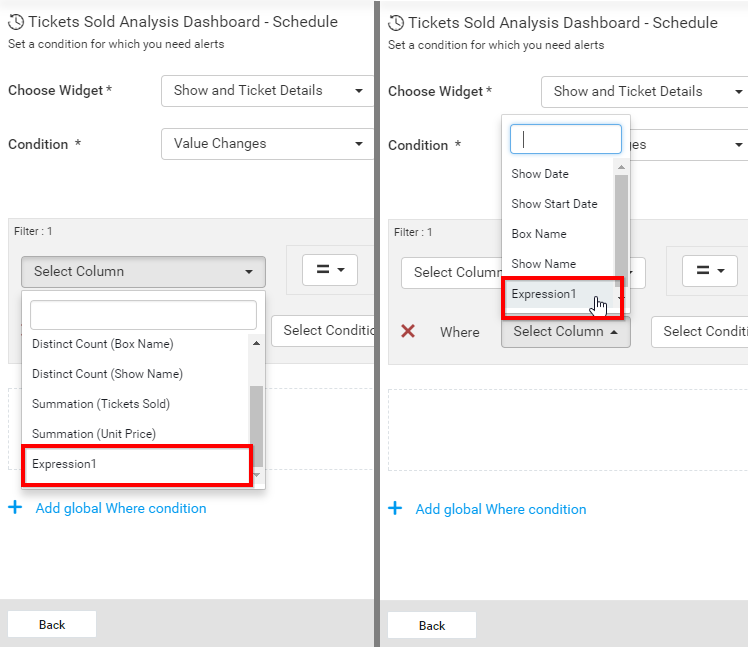 Once the dialog is closed, all the saved expressions are listed under all the select column drop downs of both measure and dimensions in data alerts screen as like below. 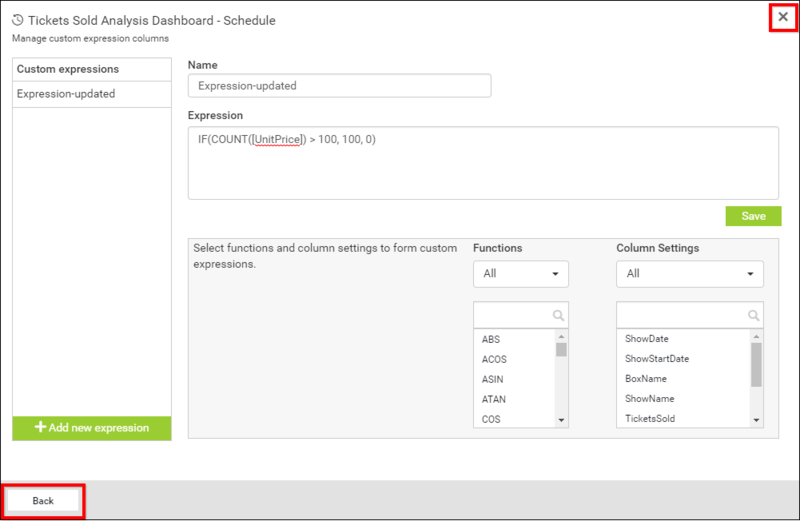 You can use the saved expressions like database columns in data alerts screen as like below. Add common Where condition for two or more filters by click on Add Global Where Condition. Email Editor provides an option to edit the Email body of the Data Alert mail and embed the selected database column values into the email body. Select Field describes the database columns that are chosen in Data Alert screen. 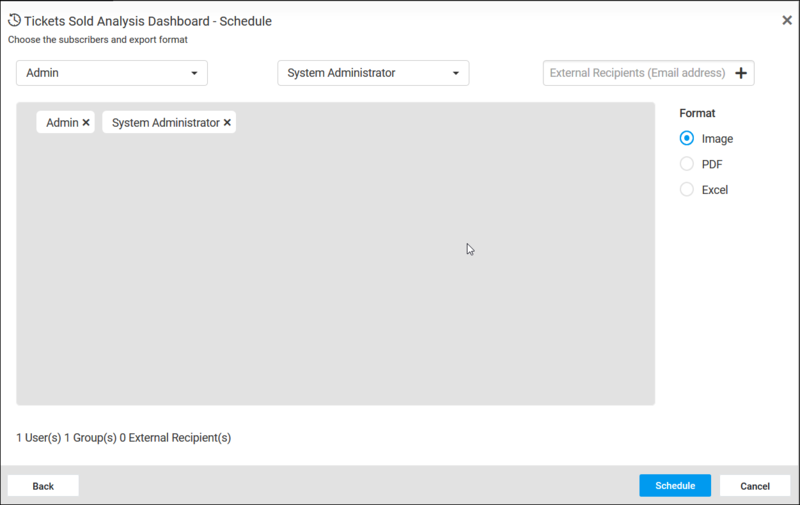 The values of each inserted columns can be replaced while sending mail by Dashboard Server. Dashboards can be scheduled on hourly, daily, weekly, monthly and yearly. Dashboards can be exported as Image, PDF and Excel. 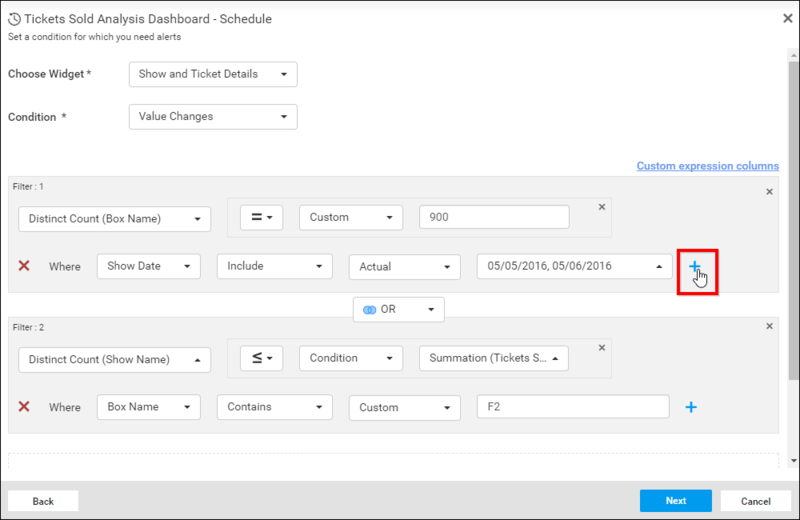 Exported dashboards can be sent to individual users or groups or to external recipients. 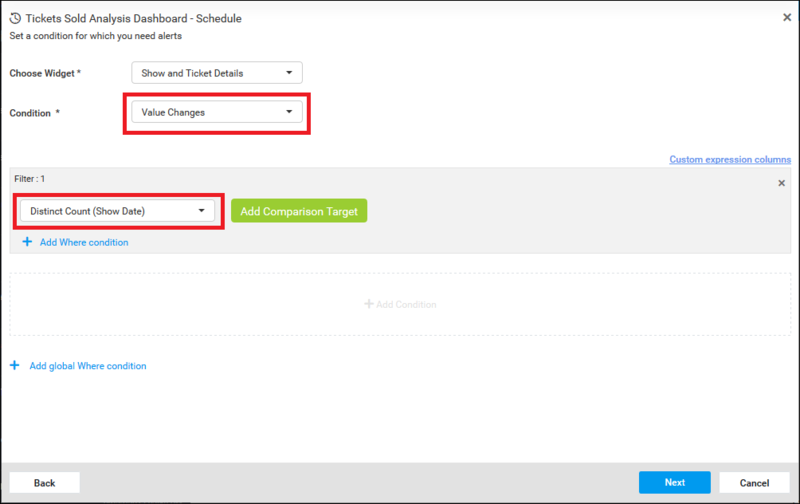 Name, Data Alert, Schedule Type, Email Content, Export Format and the recipients can be changed in the Edit Schedule dialog box. 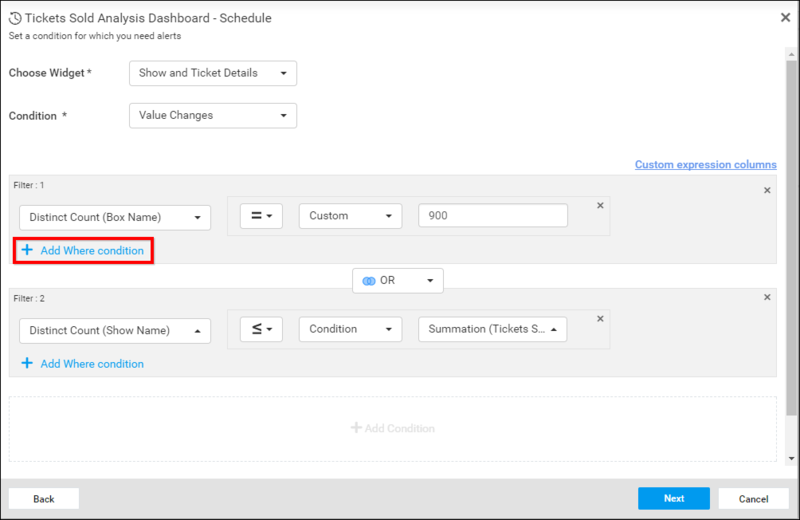 Schedules can be made to run on demand by using Run Now option in the schedule grid context menu. 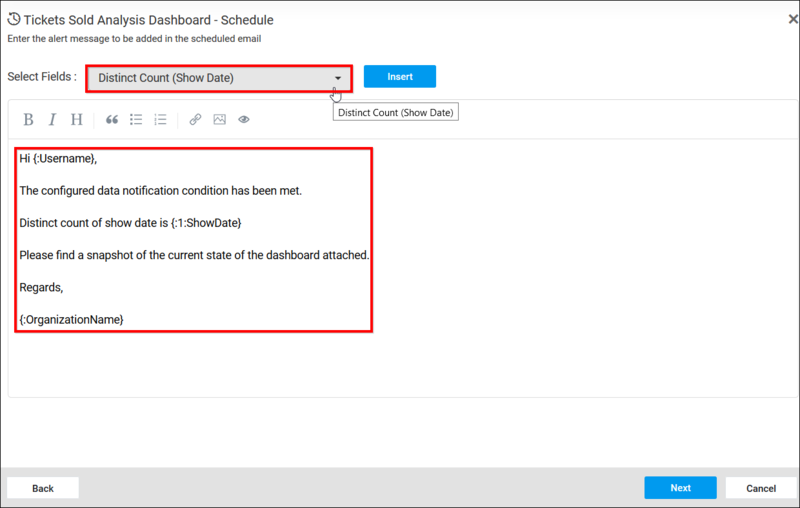 Dashboard get exported in the specified format and sent to the recipients if the threshold condition met. Data Alert can be deleted from the dashboard server when it is no longer required. 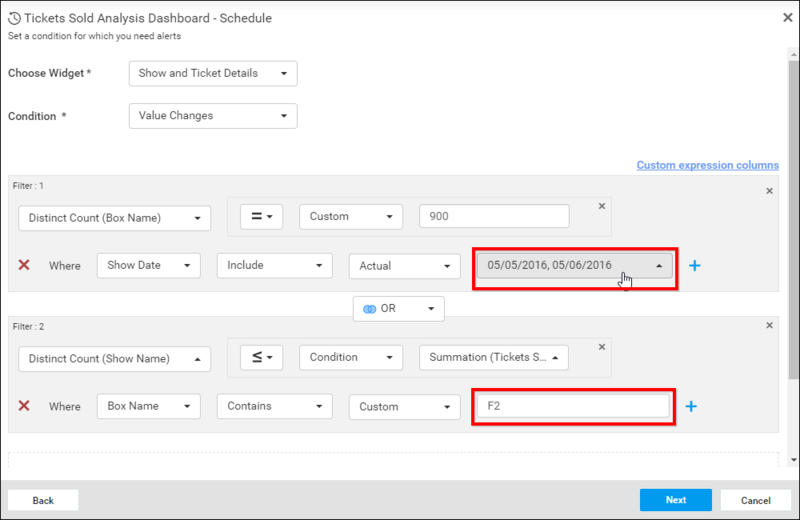 Click the Actions button in the schedules grid context menu and select Delete to delete the Data Alert.